NSPE is collaborating with the Ohio Society of Professional Engineers to defeat legislation that would limit the professional engineer’s independent judgment when making decisions about the proper type of piping. Similar versions of this legislation have been introduced in states across the nation, including South Carolina and Michigan, where NSPE has teamed up with the state societies to defeat the measures. The poor condition of the nation’s infrastructure has been grabbing headlines around the country, and NSPE is speaking out about the role professional engineers must play in making the much-needed improvements. "Infrastructure is the framework that supports virtually every aspect of our lives: transportation, commerce, public health, safety, and security," said President Kodi Verhalen, P.E., Esq., F.NSPE. NSPE and the Michigan Society of Professional Engineers are teaming up to oppose legislation that would hinder the ability of professional engineers to use their expertise and sound judgment to determine the correct type of piping for public works projects. NSPE and the Kansas Society of Professional Engineers are fighting back against an effort to erode qualifications-based selection in Kansas. A report erroneously claims that the Kansas Department of Transportation could save funds by eliminating QBS. NSPE and the South Carolina Society of Professional Engineers are working together to oppose legislation that would undermine the role of the professional engineer in making final decisions about the correct type of piping to use. NSPE and the Oklahoma Society of Professional Engineers have joined forces to oppose separate structural engineering licensure requirements included in Oklahoma House Bill 1282. In a joint letter to the Oklahoma Speaker of the House and the Senate president pro tempore, NSPE and OSPE urged them to rescind all language pertaining to structural engineering in the bill. NSPE recently published revised position statements that place the PE at the center of five issues of critical importance to the profession: licensure, energy, infrastructure and homeland security, project delivery, and professional practice. NSPE is urging the Georgia licensing board to carefully consider a proposed amendment to a rule on structural engineering that could negatively impact the practice of engineering in the state. NSPE and the Minnesota Society of Professional Engineers have teamed up to oppose an effort to create separate requirements for the practice of structural engineering. 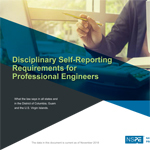 As engineering education accreditors work out the details of how best to prepare students for a changing profession, NSPE is strongly advocating for a place in the curriculum for teaching the value of engineering licensure. Accreditation organization ABET is revising its criteria for student outcomes and the engineering curriculum, and in January, NSPE urged ABET’s Criteria Committee to explicitly reference the value of engineering licensure in its new standards.